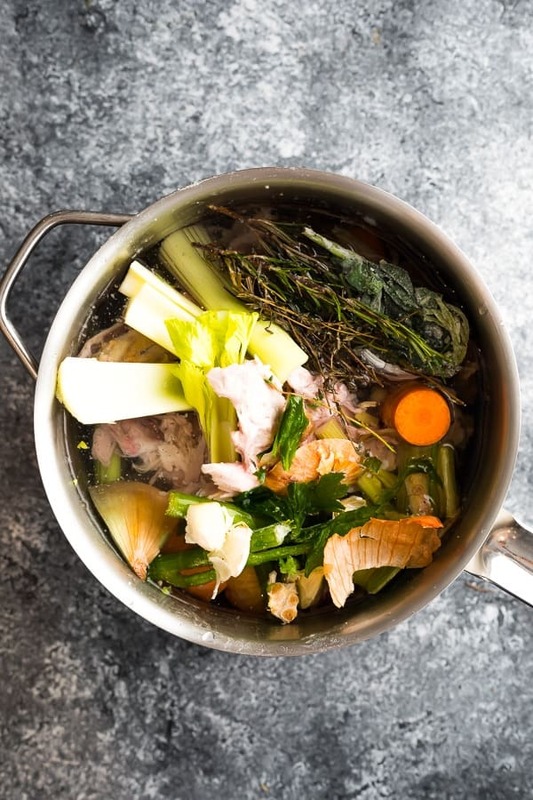 How to make turkey stock- this is the perfect way to use up every last bit of your turkey. 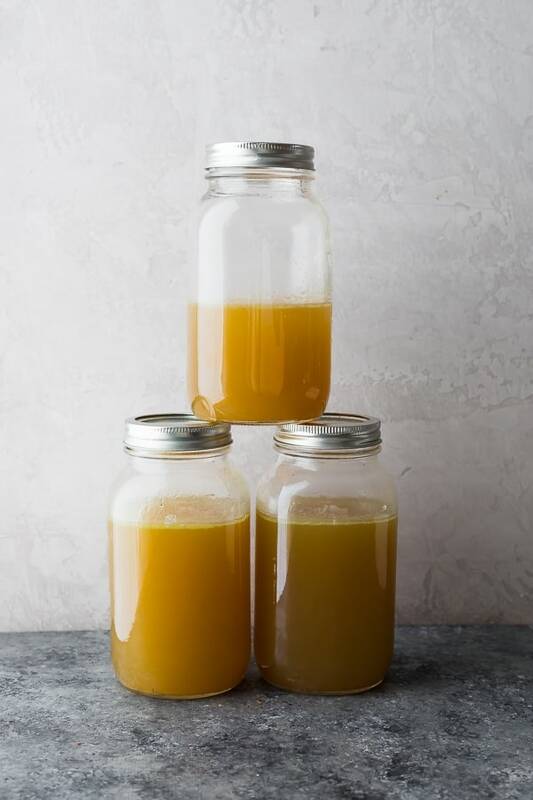 Homemade stock has so much flavor and is packed full of nutrients! Once the turkey dinner is over, it’s time to get rolling on that homemade turkey stock! I will admit that sometimes it takes a little push to get me back in the kitchen, but homemade turkey stock is so simple to prepare, you can return to your turkey coma in no time! I’m always glad I made the effort to make this turkey stock recipe from the carcass. Not only is homemade turkey stock perfect to use up in soup (like the leftover turkey detox soup I’ll be posting tomorrow), but it has so. much. flavor. It really puts the store bought stuff to shame! 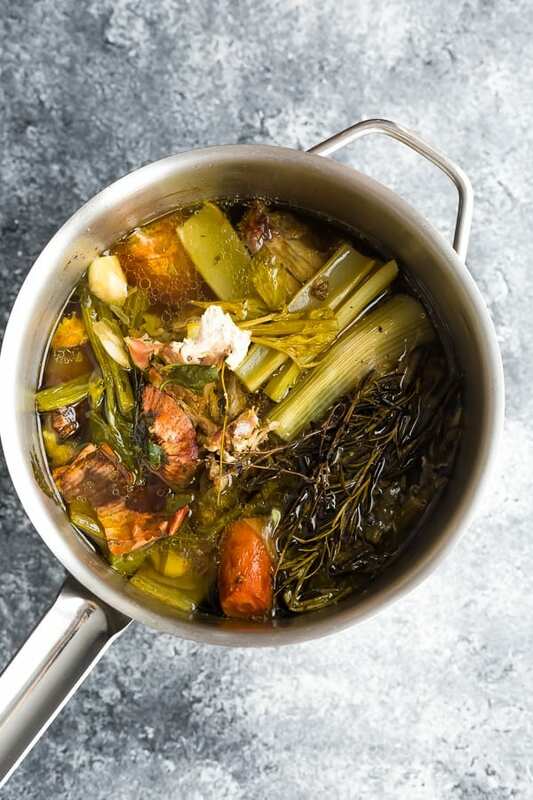 This turkey stock recipe is really kind of a ‘non-recipe’, because you can take what you happen to have and throw it in. I like to save the veggie scraps while I’m prepping turkey dinner and stash them in the freezer. I store vegetable peels, leftover herbs, the ends of celery and onions, etc. get a LARGE stockpot- if you have 8-12 quarts, that’s great! If, like me, you don’t own one, you can use two smaller 4 quart pots. Fill with turkey bones- I recommend 2 lbs at least. add leftover herbs and veggie scraps. You can supplement with carrot, celery and onion as well. 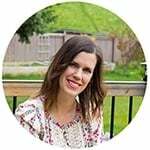 Can I use the giblets and neck when making this turkey stock recipe? Absolutely! You can stash them in the fridge or freezer until you’re ready to get making turkey stock. Is turkey stock good for you? Yes! 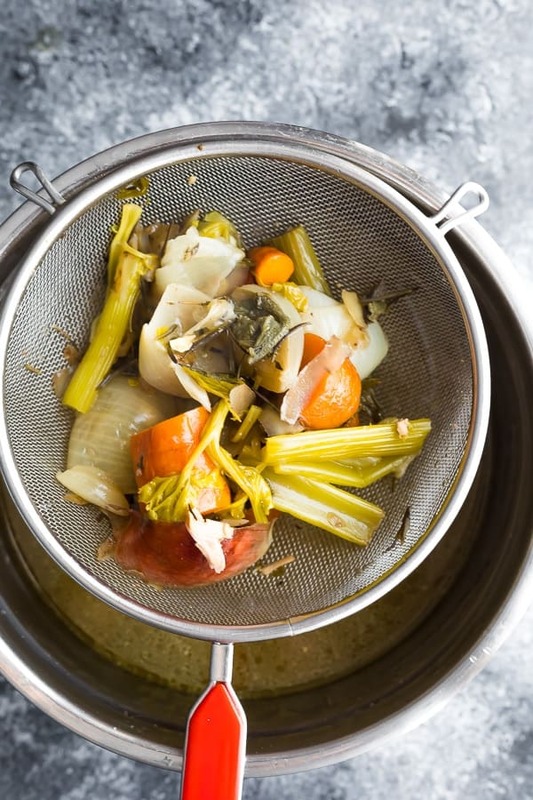 Turkey stock is full of vitamins and minerals from the turkey, veggies and herbs. It’s great to support your immune system, which is why stock or broth are traditionally offered when you’re sick. 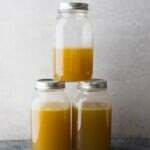 Does turkey stock contain collagen? 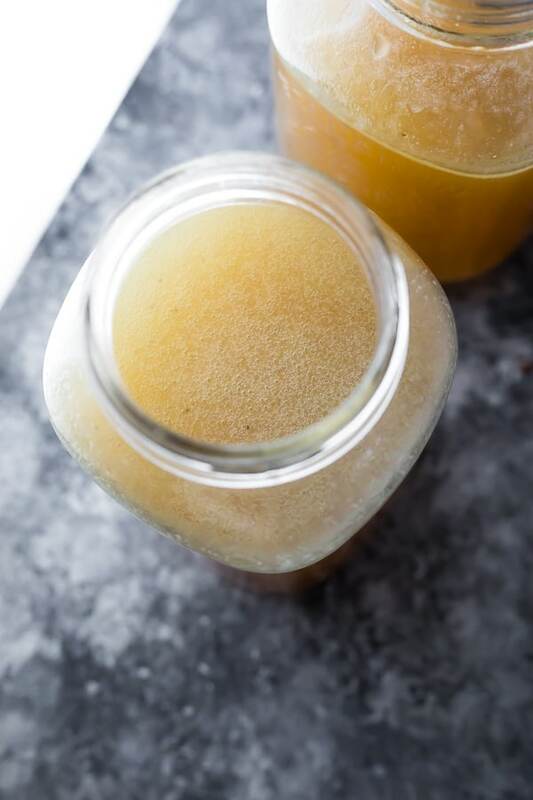 If you want collagen-rich bone broth, check out this Leftover Turkey Bone Broth (Instant Pot) recipe! In order to extract collagen from the joints and bones of the turkey, you must either simmer it for an incredibly long amount of time, or you can use a pressure cooker. How long is this turkey stock recipe good for? I would keep it refrigerated for up to 5 days. Longer than that, freeze it! How can I use this turkey stock recipe up? You can use this turkey stock recipe in SO many different ways! scraps from turkey dinner prep: carrot peels celery leaves, etc. Combine all ingredients in a 8-12 quart stockpot (or you can divide this between two 4 quart pots). Simmer (partially covered) for 2 hours. Add more water as needed to keep ingredients covered. Cool slightly, then pour through a colander, collecting the turkey stock in a large bowl or a jar. Toss all solids in the compost.